When Recurring revenue stimulates the growth, retention becomes one of the relevant element in a business. And thought for Subscription Management arises. But what actually the subscription management? Subscription management is a process where bills are prepared for the customers on a recurring basis. For example -amazon prime is a kind of subscription plan which is subscribed by every customer in order to get the quick delivery of products within 1 day. Customers will happily pay the amount because it reduces the stress of late delivery. 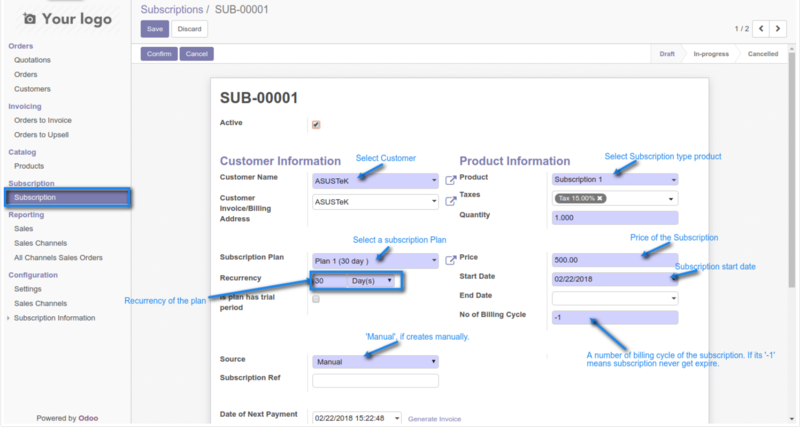 Likewise, Odoo gives the facility of subscription which helps the admin to manage the subscription for his products. It easily helps to analyze the demand for his products in the future. Odoo Subscription Management/ Odoo Recurring Billing Management Software module is a piece of cake for all the users who want to manage their subscription for the products for the ease of the customers. Using this app user can easily get the subscription to Products. Admin can easily create Subscription Plans. Admin can specify the price and duration of the plan and add trial period on plans as well. Hence the duration will start after the completion of the trial period. Admin can create a subscription product and assign the subscription plan. Also, the subscription will create automatically on the confirmation of the sales order. A subscription can be closed anytime and a draft subscription can b canceled any time. Admin can create a subscription manually. Initially, set the configuration of the module. Simply, navigate the path Sales>Settings>Sales. All the subscription plan is shown here. Navigate the path Sales>Subscription plan in order to create Plans. For an example, we are creating Plan 1 in the below screenshot and fill all the relevant details. 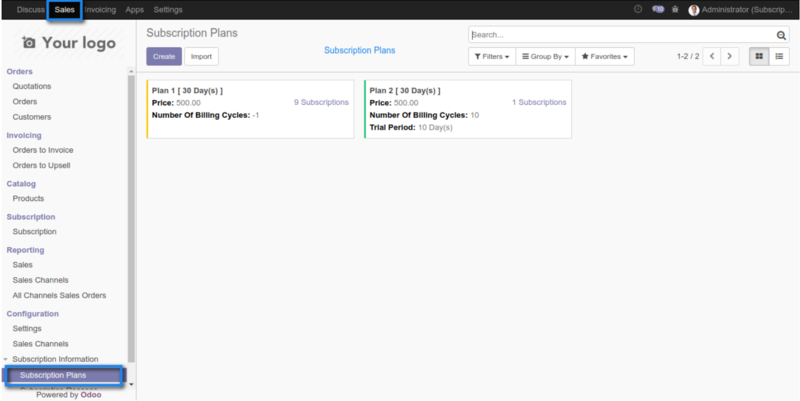 Trial Subscription plan 2, fill all the relevant details for the plan 2. In the subscription plan, enable the ‘Start Immediately’, option in order to start the billing plan immediately without any trial period. In subscription plans, enable ‘Never Expire’ option for preventing the plan from expiration. There is no need to mention ‘Number of Billing Cycle’. Check the ‘Is Subscription Type’ option to make the product a subscription type product. Now, select the Subscription Plan for the product made. Generally, there are two types of sources. How to create a subscription manually. In order to create subscription manually, select the source ‘Manual’, from the backend. Please refer the screenshot below. Creating Subscription plan through Sales order. First create a Quotation of the sale order with at least one subscription type product in the order line and click on “Confirm sale” button. A subscription will be created and the stage will be in “In-progress”. How to create a subscription for Invoices. Click on “Generate Invoice” link in a subscription to create a subscription plan for invoices. If in case the subscription is in trail period, the invoice cannot be generated until the trial period ends. If you cancel the Subscription then all the invoices are paid, other Subscription can’t be canceled or close. If the configuration setting enables the invoice is created in the paid state. Subscription management represents operations like trial management, assigning credits, and all other subscription. This module offer value to both the company and to the company.The benefits of the subscription plan will help to grow the individual’s company. This was the detailed description of the blog.Also if you want to take the deep insight of e-commerce platform? Click here https://store.webkul.com/Odoo/Ecommerce-Website.html. Please do not forget to share your feedback and suggestions under the comment box provided below.